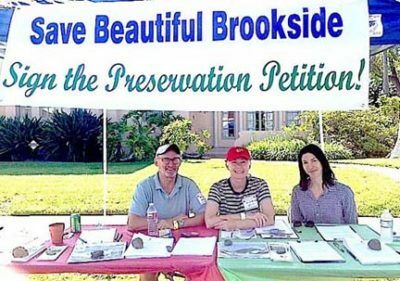 The threat of teardowns being replaced by McMansions has prompted Brookside residents to start the process to acquire an Historic Preservation Overlay Zone. PROMOTING THE campaign for an Historic Preservation Overlay Zone in Brookside at the June block party were, from left, Taylor Louden, Jan Wieringa and Roxanne Steiny. In the meantime, Councilman Tom LaBonge has made a motion for an Interim Control ordinance as a temporary effort to stave off teardown permits. Also on the committee are Taylor Louden, Roxanne Steiny and Vivian Gueler. They are petitioning property owners to pursue the zoning. Next, the community will begin a survey of each of the 400 homes in the area. The survey will determine the homes’ historic characteristics qualifying for the preservation zone. City agencies approving the zone request include the Bureau of Engineering, the City Planning Dept. and the Cultural Heritage Commission. Final steps are approval by the Planning Commission, and by City Council. Brookside is bordered by Wilshire to Olympic boulevards, Muirfield Road to Highland Ave.